The bustling neighbourhood of Bhowanipore has a whooping number of shops and will surprise you with the number of things it has in store for you. Stock up on your sporty goods from these 80-year-old stores. Kali Sports, Samur and Ecsay sports have all that you will need, from cricket to swimming, except golf. If you want something specific, they might order it for you too. There are a host of shops in Bhownipore. Buy sarees from Indian Silk House and Silk Palace. You can buy all the linen you want from Tyra and get it tailored to a shirt or crop top or pants. Attending a fancy family event? Get your indo- western outfit styled from Atara by Varisha. While walking down the lane, look out for Leather collection for totes and sling bags! Stock up on your jewellery! Right opposite Samur sports, there is a string of Jewellery shops, from silver to junk jewellery to gold there are a lot of options. National Jewellers, AC Dutta, PK National Jewellers, Noni, the list is endless. You also have Merlin Homeland Mall to jazz up and decorate your house! Right opposite the Samur sports is the lane which has 4 or 5 shops selling Ayurvedic herbs, products and medicines. Bid farewell to all the hair and skin problems. These shops have certified doctors and provide consultations as well. Head over to our all-time favourite Seagulls Bookstore for limited-edition books and European literature. While browsing the streets, we also found Book Beaureu – the list of authors extends from Chetan Bhagat to the likes of Sylvia Plath and Lord Byron. 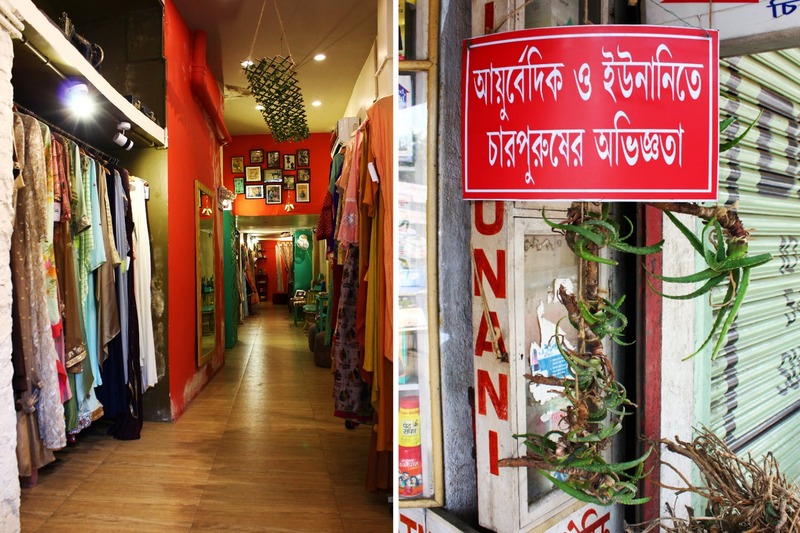 Head to this place to score books on Bengali literature! Bhowanipore has a lot of buildings which have been there forever, exuding Old Kolkata feels. Look out for the mint green building right next to Escay Sports, it’s quite interesting. You can’t miss out on the Bhownipore Police Station, which is one of the most well-maintained police stations in Kolkata. Bhowanipore also has a few single screens – Basushree, Indira, Bijoli, where you catch a movie and enjoy a very different experience altogether. Relax after a long day, get a spa or treat your feet with a pedicure. Bhownipore has a host of parlours and salons you can go to. The Beauty Palace, Ozi Spa, Rebirth, these places will definitely help you rejuvenate. Munch on some Kobiraaji (INR 90) and Moghlai Parantha (INR 40) in the Sanghu Valley Cabin and get some chill time with bae. You could always head to the bigger establishments like Baccara and Chai Break. Pick up a coffee from Café Coffee Day. Or maybe some sweets from Girish Chandra. If you are a tea person, there a lot of tea stalls, the aroma will make you stop even on a hot summer day!